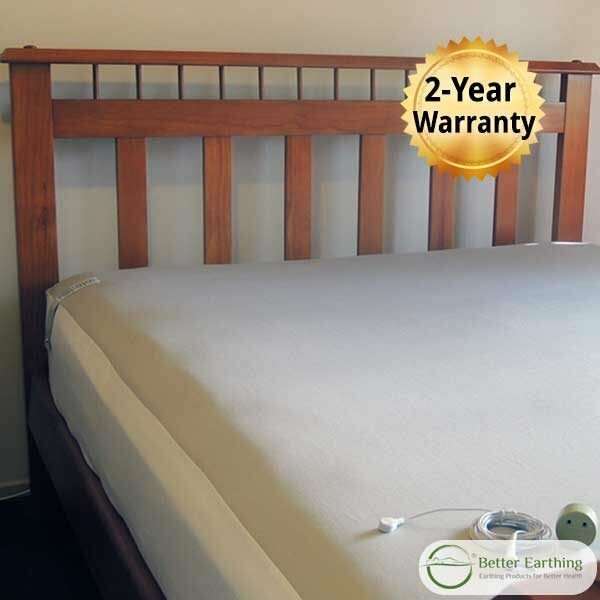 Get 8 hours of Earthing while you sleep on the only Australian made earthing sheet that’s designed as an underlay. It comes with a 2-year Warranty and a 1-year Satisfaction Guarantee. Available in King, Queen, Double, King Single and custom sizes. This is a ‘Rolls Royce’ earthing sleep system. 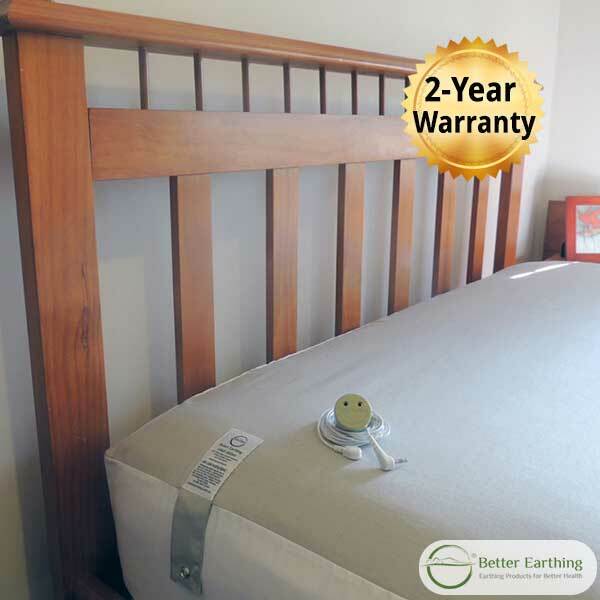 It is gently powerful and lovingly sewn in Australia using superior materials that are designed to last. 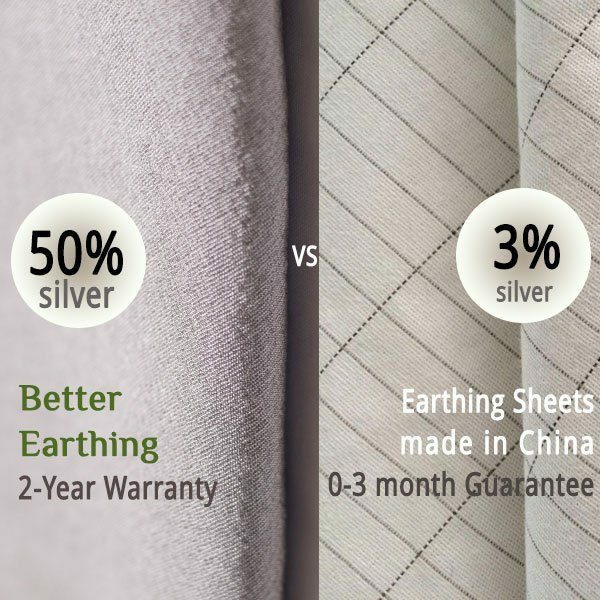 Our custom-made earthing fabric contains 15 times more pure silver coated fibre than standard earthing sheets, which only have silver fibre in 3% of their fabric compared to 50% in ours. Our premium earthing fabric is made with French silver fibre (50%) and sustainably produced Tencel (50%). For more details see our product description below. 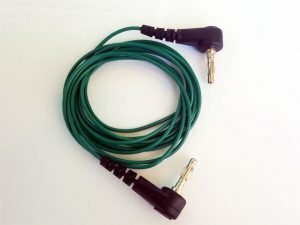 This product is sold as a complete system with a straight lead and an AU/NZ earthing adapter for earthing indoors (if you would prefer a coiled lead let us know by leaving a note when you order). What is an earthing undersheet? It is a thin underlay for earthing with pure silver coated fibre. You put it under your existing sheets. This undersheet delivers big health benefits including improved sleep, reduced pain, and better circulation. See earthing benefits for more or read our 50+ customer reviews on this product. This product is sewn in Australia using our custom-made earthing fabric with 99.9% pure silver coated fibre, that’s treated with anti-oxidising agent to increase its longevity. Silver is naturally anti-bacterial and antimicrobial, and keeps your undersheet hygienically fresh (see more under the Antimicrobial tab). Tencel is a strong natural fibre that is sustainably produced from eucalypt trees in Austria using an eco-friendly process. We use Tencel that is undyed and unbleached – it is a natural white colour before being woven with the silver. The grey-silver appearance in our fabric comes entirely from the silver fibres. You can actually see the silver threads in this fabric. See a close-up image in on our Earthing Sheet Fabric Explained page. The side skirt is 100% cotton. The fit is generous to suit deep mattresses and those with an additional soft top. Better Earthing Sleep Systems are the first Australian designed earthing bedding to work through bed clothing and the fitted sheet you directly sleep on. NO direct skin contact is needed. The tiniest amount of body moisture or humidity in your clothes and sheets, compressed by your body weight, creates conductive channels that very effectively pass earth from your Better Earthing Sleep system. By not sleeping directly against your earthing undersheet, the silver fibre is protected from body oils, which can impair conductivity. This helps make for a long-lasting product. Standard earthing sheets are designed for direct contact with bare skin and use silver coated fibre in 3% of their earthing fabric, a design that easily wears out – see our earthing warranty page for more info. Watch Peter demonstrate how effectively our earthing undersheet conducts free electrons from the earth through clothing and a regular sheet. King Single: 203cm x 107cm x 35cm deep sides. Double: 188cm x 138cm x 35cm deep sides. Queen: 203cm x 153cm x 35cm deep sides. King size Australian: 203cm x 183cm x 40cm deep sides. Simply machine wash silver slumber on gentle cycle with detergent that contains no bleach, no whitening agents and preferably no oils. We use Earth’s Choice laundry liquid, which is available from most local supermarkets. Dry in shade. I purchased the grounding mats and sheets for my wife and she is extremely happy with the outcome thus far. She is very sensitive to emf and electrical radiation from PowerPoints. Earthing is part of our strategy to help remove excess charge from her body. In the two weeks that she has used the grounding mat and more recently the bed sheet and pillow case she has improved sleep pattern since using the sheet and pillow case. Really happy with the outcome. These sheets have had a huge affect on my husbands energy levels! He used to take several naps throughout the day, every afternoon he’d be on the couch sleeping (for the past 15 years it’s only gotten worse – even got him checked for sleep apnea). Since the earthing sheets 6 weeks ago, he barely ever naps during the day! This is huge for us both. Not only is he less tired, he’s got more energy and has started being more active at home. He’s fixed a storm pipe that he’s been promising to fix for the past year. He’s done a TON of gardening around the house – now I don’t have to get the handyman back to do the gardens! He said it’s “the most active I’ve been in… years”, and that’s 100% true. Adding earthing sheets is the only thing we’ve changed. He has also almost completely stopped getting heart burn, which used to be a daily complaint! As for me, I noticed that my dandruff reduced by 85% – basically immediately. I’ve not changed any products or done anything else! And that dandruff has been with me my whole adult life. Also, I’ve started remembering my dreams. Now I can write down a whole page of dreams, I’ve been trying to remember my dreams better for years and have tried various supplements with no luck. So far my PMS pain has been less, and my periods have been shorter and lighter. For the past few years my cycles has been all over the place, so I’m tracking that too to see if it will go back to the 28 days cycle I used to have. I also have more energy, and don’t get overwhelmed as easily. I’m finding that I’m getting through my to-do lists, and decluttering areas in the house that have sat untouched for years! I have a back condition which – when it flares up – only Voltaren (anti-inflammatories) will help. I’ve noticed that I’ve been able to push myself a lot more (physically) without my back getting sore, so to me this indicates less inflammation in my body as well. For the first 2 weeks of earthing, we both needed to adjust. I noticed that at first I was much hungrier and ate more, slept more. My hubby also slept more. But that resolved after 2 weeks. I feel good as soon as I lay on my bed, and honestly think earthing is a hugely important health secret that every person needs to observe! First morning I woke up diagonally across my bed haha Hasn’t happen again. I do feel I’m sleeping deeper. I have been walking around for years barefoot as much as possible. 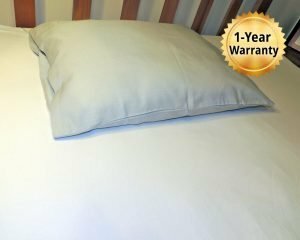 I waited a couple of months because I wanted it to be an honest review as I know future customers would read it as I did when I was thinking about purchasing the grounding sheets. First of all, the quality and workmanship of the pillow case and sheets is excellent. The information and care instructions it comes with is also helpful. However the best part is, that it worked for me in easing up the pain. I was one of those people that would wake up throughout the night aching. I live in the city,work in the city and live in an apartment up high. I dont get to feel the earth much at all barefoot etc or lie on grass. Probably after about 4 to 5 weeks,I realised that I had stopped waking up throughout the night in pain. I also fall asleep a lot quicker and for your customers who are interested in it for esoteric grounding purposes…….yes it definitely helps with that too. I just wanted to say thankyou, that your customer service has been amazing & that the sheets,pilowcase & wristband are great products. My insomnia has improved and keeps improving since I have been sleeping on my earthing underlay. I won’t be without it from now on and recently took my small travel pad away with me to a Yoga retreat. My husband and I really love these products. We have been sleeping on our undersheet for four weeks now, and both hav shad benefits from it. I also sit on an earthing pad several hours a day. I have dealt with a number of inflammatory conditions including chronic fatigue, fibromyalgia, food intolerances and insomnia, and sleeping earthed has helped so much. I have way less joint and muscle pain, less bloating in my abdomen, and no aversion to my bed anymore. The insomnia has improved a bit too so far and I plan to review another few months down the track. My husband sleeps very soundly now, has less stiffness in the mornings, and more stamina for his long work days. He noticed his back cracking during the night for the first couple weeks, adjusting in a pleasant way. We both read the Earthing book, and looked into the studies done and have no doubt this is a profound health revolution for those who do it! Peter and Corrina have been an absolute delight to communicate with, and their products really are excellent quality. We are so thankful we rediscovered this science & ordered the products when we did. I am loving my Earthing sheet & pillow case! I have suffered for many years with chronic inflammation in my muscles joints & mucosa (sinus & gut), as well as struggled with depression, chronic fatigue & hyper-sensitivity. In one short week of sleeping with the Earthing products, I have experienced a massive reduction in all my symptoms & am feeling so much better. I haven’t felt this good since 20 years ago! I am going to buy a set for all my family members as I can truly vouch for the effectiveness & benefits of Earthing in this way. Thanks for bringing such quality products to the Australian market. Things are much better now as I find when I sit on the earthing mat if I have any pain it goes away in a few minutes better than any painkillers. I sleep on it too and I find my sleep is better than it was. I am converted now 😊 and will be buying a sleep sheet soon. I just wanted to tell you that my earthing undersheet is doing wonders for my sleep. I have been feeling fabulous since I got this. Thanks so much – it’s brilliant! I want to report that my husband feels fantastic- more flexibility, no more joint stiffness and great energy. However, it’s a different story with me! I was hoping for improved sleep. The first 2 days was good, I immediate felt more relaxed and “aware”. On the third day I became restless, had ongoing nightmares, and simply couldn’t sleep at all. After few days I developed strong, blunt pain right underneath my skull line, at the back of my head. It was so intense I couldn’t lift my head up from supine. It took about a week to subside. Then after about a month I tried it again. Restlessness and that strange pain returned the first night again!! I contacted Better Earthing who suggested that I should ease in more slowly, and reduce the earthing strength as some people can experience discomfort initially. I have had a whiplash injury twice in my life, AND I have an autoimmune condition- rheumatoid arthritis. So I reduced the strength of the earthing underlay by sleeping with a cotton/poly blend blanket for a week with no problem, and then I removed it and had no more problems sleeping, or with the head pain! As the matter of fact, that pain is completely gone as of now! I’m very happy! All going well after about a month of using the fitted earthing sheet. I originally purchased it for back pain, which I noticed an immediate improvement in. I also noticed that my sleep is deeper, and when I do wake up I get back to sleep generally with 10-15 minutes. Which is great as I have a lot of disturbances from our cats at night!! Also initially had some pretty vivid far out dreams – I think my subconscious processing old issues. However I don’t wake up feeling anywhere near as affected by the dreams. Overall also have noticed that my body is in healing mode, old scars/lumps are slowly starting to heal. Much better than my previous earthing sheet, I notice the effect within a few minutes of getting into bed. In combination with the other things that I do for my health I am excited to see what other changes happen in the future! My sleep has definitely improved both in duration and quality of sleep I am getting. I wake up with less aches and pain and when I have a restless night I’m finding I can get back into a restful sleep which was impossible before the Earthing sheet. A restless sleep would keep me wide awake all night with no reprieve and now I’m more relaxed about waking up in the middle of the night knowing I am able to fall asleep once more without difficulty. What a boon that is for my general sense of well being. The sleeping has been awesome. Best restful nights sleep. I had a sore back on Christmas Eve and I booked an appointment with my Oesteopath but I couldn’t get in until the 28th December. Well I slept on our beautiful earthing underlay and just like magic … my back pain went away within 48 hours !! I had to ring and cancel the appointment. I have dealt with the Better Earthing team on a number of occasions over the past 2 years. Every question has been thoroughly answered and Peter has provided information and service, well beyond my expectations. The quality and efficacy of Better Earthing products are far superior than other earthing products I’ve used. Each order has been sent immediately and arrives beautifully packaged. My health has improved beyond what I would believe possible, by being earthed while sleeping and spending hours on the computer. Thank you to the team! For years I have been waking up every 2 hours or so at night and often struggle to get back to sleep. After a few days I was sleeping for four and a half to six hours at a stretch and at the 2 week mark, I go back to sleep very quickly so I am catching up fast. My blood pressure is nicely back in the normal range since we started earthing too, so that is an extra bonus. The earthing sheet has proved to be most helpful for both my husband and I.
I have received a lot of relief from the pain in my head from Neuralgia, which started 18 months ago with Shingles. Also relief from Arthritis in my knee. But the I think the best thing that has happened, is the now almost non-evidence of coughing from my husband who has a Bronchial problem, that has been with him for several years. We are both so happy about this. He is also a light Diabetic so the assistance with feet generally and the blood circulation is of great help. I have to say that I was sceptical when my husband suggested we buy your product. I use to wake through the night due to the pain in my shoulders and hips and having to change sides all the time and I woke up feeling tired. I do sleep far better and the pain in my hips and shoulder (bursitis) don’t seem to wake me through the night. My husband and I have been sleeping on our Earthing sheet now for a few weeks. I look forwards to going to bed every night now as I can get to sleep much quicker and feel I have a very deep sleep. The pain in my back that I used to wake up with every morning has reduced to a mild stiffness. I also believe that it has had a calming effect on me as I feel more relaxed during the day. My husband also agrees that he can sleep much better too. We are both very impressed with the product. Thank you so much for your wonderful earthing sheet. I feel so well and have felt an astounding improvement in my health. 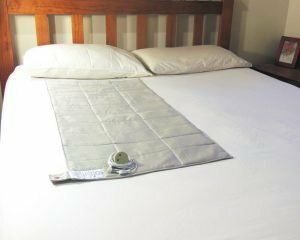 I am a chiropractor in the blue mountains of NSW and have been raving about the sheet to many of my patients and I know 4 different people have now ordered the same sheet and are equally as thrilled, especially patients dealing with chronic pain. Thanks for what you are doing! I’m so delighted with the Earthing undersheet. I’ve had a mild ache in my hip for years which I only notice in bed when I’m trying to sleep – and from night One, there was no sign of it. I’ve also started gym training. On my first session – before the sheet arrived – I had severe delayed onset muscle soreness. After session two – the night after I first slept on it – there was no DOMS whatsoever, which defies explanation other than the effectiveness of Earthing. I am happy with the purchase and loved the way it arrived carefully wrapped and with a ribbon. The product is of good quality and I like the information and tracking sheets. I notice a tingling under my body when I am on the earthing sheet or when my bare feet are on the ground. I have had better, deeper and more restful sleep, with fewer wakings or need to urinate in the night. I have a clearer head and more joie de vivre, and less nervousness. I really look forward to longer term changes, particularly lowering with my blood pressure. My husband feels the cold and has body aches. So far he has not noticed any difference – however we are in the coldest part of winter. My Dad is thrilled with his undersheet. His knee pain went after the first 2 nights of sleeping on it – he said they still feel stiff but no pain. My earthing sheet is life changing. Couldn’t be happier. I’m sleeping much better and I wake up feeling as though I’ve just had a coffee. I recover better after training and I’ve noticed that cuts on my hands heal much faster. So like I said, couldn’t be happier. I also ask my customers who purchased one on a daily basis how theirs are going and they love, love, love them! I personally have had very vivid dreams and wonderfully deep sleep periods that weren’t as noticeable before installing the earthing undersheet. My wife and I both commented on feeling slightly warmer – particularly in our extremities – and my wife is no longer waking up with “pins & needles” in her hands. I would certainly put this down to improved circulation. – my quality of sleep is better as I find I have more dreams and deeper more restful sleep. – I used to feel my body tense for no reason ( maybe too much electricity ) and I am not sure why that was . Hard to explain but this feeling is totally gone now . – The joint stiffness still there but I don’t feel the body tension anymore . I have been using the Better Earthing Sheet for 4 months and my sleep has improved tremendously. Now, I have better quality sleep whereby I do not wake up in the middle of the night as I used to be. Another noticeable improvement was the numbness on my right hand also reduced. I’m very, very happy with the products and I feel that my whole body has calmed down during the night. I have much less discomfort during the night and my energy levels during the day have increased quite substantially. I only just shared this information with my GP yesterday and suggested it might also help her other patients. My workmates who purchased at the same time I did are also happy and we are spreading the word. Thank you so much for providing a wonderful product and service. From the first night I noticed a difference with my health. At about 2am on the first evening, I woke and felt that the effect was too strong for my body and I unplugged the sheet from the wall. When I awoke later in the morning, I noticed my nasal congestion was greatly reduced (I’ve had this for some years now) and also noticed increased energy and more mental clarity straight away. I’ve been using an earthing sheet from another company for about 3 years but did not experience the same level of effect from that product, although there was definitely some benefit, particularly in the early days. I’m very grateful to have stumbled across the exciting world of earthing and to be using this Better Earthing sheet in conjunction with my other earthing protocols. I’m so glad I got your earthing sheet. My husband’s arthritis is far less painful & I am sleeping so well. Allen has been experiencing episodes of atrial fibrillation at very regular intervals (sometimes twice a week) for at least the last three years. However since we first started using the earthing sheet on 9th August he has not had one episode. We will continue to monitor this but feel very optimistic. So apart from all the other many health benefits of earthing to both of us, the earthing sheets have been a massive blessing for Allen for this one reason alone. My knee and legs feel so much better – more easy movement and I am able to pivot without pain. I was down on my hands and knees with full weight on my knees looking for some papers that had fallen behind my computer – and it dawned on me that I couldn’t have done that a month ago. My hands are still a bit sore and stiff – arthritis well entrenched – may need a bit longer. I am 72 and don’t take any medications – just a few vitamins – and am quite active – walk 5 times a week and play golf twice. I am happy to use your earthing sheet and am hoping for more relief as time goes on. I want to be able to keep up my active lifestyle. We have experienced great results. So far we’ve had better sleep, more energy, less body aches and pains, reduced inflammation. Have had the earthing sheet on for 5 days now. I have been sleeping well and have not been up in the night to go to the toilet at all. Previously I would be up at least once, sometimes twice in the wee hours. Pun intended. 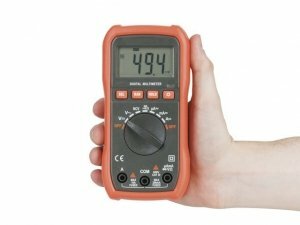 The multimeter reading goes from 1.58 down to 0.05 on the sheet. Feeling positive about the potential well being that is in store for us. 1. My husband wakes up now (from the first night) without back pain/discomfort. 2. Both of us are sleeping deeper, getting to sleep quicker, and falling back asleep quickly. 3. Both of us are losing less hair. Noticed this within 2 nights. 6. Some upper leg spider veins seem to be fading/not so noticeable. 7. No more heartburn for me since the first night. 8. We both feel more refreshed each morning, and feel more focused during the day. I was previously using an earthing sheet that I slept directly on- however it didn’t even last a year- so I’m excited about the durability and quality of these undersheets. The biggest Impact for me of sleeping grounded is the effect on my immune system- it really boosts it. I also sleep very well grounded – such better quality sleep. Thank you very much. Vivid dreams initially,broken sleep now followed by deeper more refreshing sleep. I had been less than impressed with the 3% silver thread earthing sheets. Am very impressed with the effects of this one! In the first week, I did not experience much change as I expected — I’ve slept on earthing sheets before so I supposed I would experience results quicker. It has been a month now and I have noticed the difference taking effect the last few days — I’m sleeping heavily, and for the first time in years, I can actually sleep in past 7:00am on weekends and not feel tired. I could never do this even if I stayed up till after midnight the night before. I get deep sleep now (the drool-worthy kind) which is so satisfying! The pain in my back has also gone as well as the awful pain in my neck! I find that I wake up in the same position I slept in and I don’t wake up in the middle of the night to go to the toilet! My only problem is that a couple of mornings it’s been hard to wake up from my sleep, but I think this is only an adjustment period. This has been the best investment for my health. Thank you! I have been using the earthing sheet on my bed and a mat under the computer desk for nearly a year and love them. A few weeks ago my husband and I went away for four days holiday and I had no earthing sheet. The first night away I was so sore and achy from arthritis and came close to booking a massage the next day. It wasn’t till I got home that I realised I hadn’t had the sheet under me for four nights and now I really appreciate it all the more. It makes such a difference. I didn’t realise how good the bed sheet is until I didn’t have it. I am very happy with my new earthing sheet. It is a so much better product than any I have bought before and so much better value. It has substantial fabric, well made, fitted & fabulous! Best of all is that it can go under the bottom sheet! I am aware of Dr Sinatra & all his research & have been earthing for years. As kids in far nth Queensland, we were always barefoot. I still spend all day working without shoes & going for a run on beach/bush barefoot. Not only good for earthing benefits but also for feet, ankle & knee strength & flexibility. I am telling everyone about my great new sheet – I love it, thank you. Hi All. I brought this product and all I can say is AMAZING! I’ve been taking sleeping tablets for the past 6 months because I was having trouble getting to rest. After sleeping on the earthing sheet, I sleep deeper, more soundly. My dreams have become very vivid, as I feel more reconnected and less distracted as I rest. Also, I don’t need the tablets to get to sleep…the moment my head touches the pillow, my body responds and relaxes. A must for every home in this mad, modern world, where rest and re connection are part of our foundations during observation and reflection. We are enjoying our earthing sheet. Sharon has lost the pain in her upper arms completely (she thought she had PMR). Her night terrors have decreased by 90% and she seems to drop off to sleep more quickly. I seem to get better sleep nowadays too and wake up more refreshed. If there is one criticism, the elastic around the sheet is not tight enough. The sheet always “migrates” to my side of the bed overnight and comes out from under the mattress on Sharon’s side. All in all, we are happy with our purchase. my body is feeling better when waking up since i got the earthing sheet. I currently have an autoimmune disease (Hashimoto’s) and was working excessive hours operating in a stressful workplace. To add I had an accident with boiling water and experienced extensive burns to my torso and legs. This caused much pain and discomfort, lack of sleep, constant headaches (which went on for days), muscle weakness and debilitating exhaustion. The shock of the accident was an overload for my adrenals and the body was shutting down. I had been using an earthing sheet and matt but of inferior quality and was well aware of earthing for a couple of years. 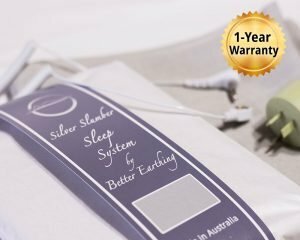 Once I received the earthing sheet and pillowcase from Better Earthing, I noticed after a few days my body started to experience a deeper sleep. I can feel the tingling at times and the sensation feels like I’m sinking into the experience of earthing & don’t wish to get out of bed. This feels like the body is recalibrating to its natural state of being! I feel the benefits once I get out of bed, feeling sharp, alert, the mood shifts.Thank you very much for this product; no doubt a step by step process in helping restore the body and my adrenal health. The medical profession needs to get on-board! Mum is 86+ suffers from Parkinson’s & her mobility has been very limited also for at least 5 years she wakes up am & feels quite ill. However in the last week sleeping on earthing sheet she has woken up feeling fine with no nausea. I took her on an outing today & were gone from 9am til 4pm & she did major walking & only got tired once we stopped. She did have the help of her walker but a couple of weeks ago she wouldn’t have lasted an hour. Myself* I’ve had both thumbs so sore for so long now & inflamed but after the first night I noticed a big difference & slowly the swelling has gone. I have high blood pressure & even though it is still up it has dropped. I now wake up of a morning planning my day where before I was flat & not interested in doing anything which is so not me but have been that way for a few years now. I feel it has made a difference & am anticipating further improvements as the time goes by. My husband has not had good health in quite some years with aches, pains, depression, diabetes, insomnia ( the whole box & dice) but he now is saying how he’s feeling much better & can only put it down to the earthing sheet. He is more sociable & interested in getting things done around the house. So far we are very happy with our earthing products & hope things keep going in this direction. I am enjoying the sheet and I have noticed a deeper sleep than normal with more vivid dreams. My bedroom voltage varies between 1-10 volts (unearthed) which goes down to 0.03 volts (earthed) even with a top sheet over the silver sheet. I have suffered from painful stomach ulcers, reflux and stomach pain for a couple of years now and after 2 weeks I have noticed a huge improvement in the amount of pain and inflammation I experience. I did not expect this at all. Of course I still have to watch my diet, but the ability of Earthing to reduce inflammation is what I am grateful for. We have had our custom size better earthing sheet for one week and honestly we sleep like we’re in Heaven! 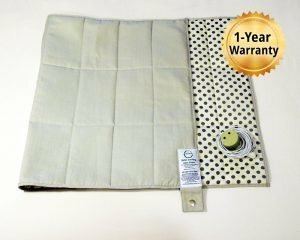 I purchased a set of earthing mats, a pillow case and bedsheet from Better Earthing. After the first few days of using them I noticed that I was extremely tired and even found it hard to get out of bed. I thought that this was strange as earthing was meant to energise me not cause fatigue. The extreme tiredness, however, soon passed and was replaced by me experiencing deeper sleeps. Once I had begun to experience those deeper sleeps I found that I was more energised during the day. The most dramatic benefit of “earthing myself” was yet to come. I have been taking sleeping pills nightly for about 10 years and in spite of my best efforts I have not been able to sleep without them. Given the ease at which I fell asleep with the earthing bed sheet I decided to try to give up the sleeping pills cold turkey. That was about a month ago and I have not taken a single pill since. I was totally shocked that it was able to do so with such ease. I still wake at night but fall back asleep easily. I have been using the Better Earthing sheets now for 3 months. Before using them I was challenged getting enough quality sleep every night. Since using the new sheets I have noticed much deeper sleeps and also only needing a maximum of 6 hours a sleep per night and waking up feeling wonderfully rested and ready to start the day as soon as I awake. Since purchasing the earthing sheet, I have slept better and deeper than ever like I am encased in a protective cocoon. I have always understood the merits of being connected to the earth and the benefits are enormous to my wellbeing, mentally and physically. I always have energy when I wake up and feel like I’ve topped up on goodness all night long. Years ago, I previously owned another earthing sheet with less silver content and it is obvious to me how more silver has a greater impact on my wellbeing. The sheet looks beautiful and the convenience of not having to wash the sheet regularly because it is under the main sheet is clever and practical. I have never had any ailments prior to sleeping on the earthing sheet, however I do feel that the continued use of the earthing sheet is keeping my health in optimal condition so I won’t have any issues in the future! I would recommend this product as a must have in the house, alongside running water or electricity! I get a little ragged from long working hours and long commutes to work, which can cause me to have a little bit of insomnia or deep sleep issue’s. Also I do physical work which causes aches n pains as one might expect. 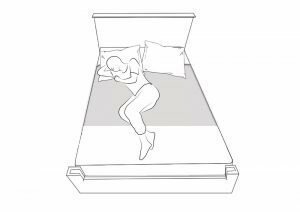 Having used the earthing sheet for just over two weeks now, I notice a marked improvement in sleep and feel more rested and vital as a result. Less aches and pains too, which is great. And I just feel more grounded, or earthed, if you prefer! My partner is also enjoying the benefits. After 4 days of sleeping on a fitted sleep system my arthritic stiffness in my hand and hips had disappeared. It seemed too hard to believe. But now 4 weeks later, all is still good with no arthritic stiffness, and I now know the Earthing sheet did this.